Abel Janszoon Tasman (Dutch: [ˈɑbəl ˈjɑnsoːn ˈtɑsmɑn]; 1603 – 10 October 1659) was a Dutch seafarer, explorer, and merchant, best known for his voyages of 1642 and 1644 in the service of the Dutch East India Company (VOC). He was the first known European explorer to reach the islands of Van Diemen’s Land (now Tasmania) and New Zealand, and to sight the Fiji islands. His navigator François Visscher and his merchant Isaack Gilsemans mapped substantial portions of Australia, New Zealand, and some Pacific Islands. Teerketelsteeg, the alley where Tasman lived when he married in 1632. Abel Jans Tasman was born in 1603 in Lutjegast in what is now the province of Groningen, the Netherlands. The oldest available source mentioning him dates 27 December 1631 when, as a widower living in Amsterdam, he became engaged to marry 21-year-old Jannetje Tjaers from the Jordaan district of the city. In 1633 he sailed from Texel to Batavia in the service of the Dutch East India Company (VOC), taking the southern Brouwer Route. Tasman helped to punish the people from Seram Island who had sold spices to others than the Dutch. In August 1637 he was back in Amsterdam, and the following year he signed on for another ten years and took his wife with him to Batavia. On 25 March 1638 he tried to sell his property in the Jordaan, but the purchase was cancelled. In 1639 he was second-in-command of an exploration expedition in the north Pacific under Matthijs Quast. The fleet included the ships Engel and Gracht and reached Fort Zeelandia (Dutch Formosa) and Deshima. In August 1642, the Council of the Indies, consisting of Antonie van Diemen, Cornelis van der Lijn, Joan Maetsuycker, Justus Schouten, Salomon Sweers, Cornelis Witsen, and Pieter Boreel in Batavia despatched Tasman and Franchoijs Visscher on a voyage of which one of the objects was to obtain knowledge of “all the totally unknown provinces of Beach”. This expedition used two small ships, the Heemskerck and the Zeehaen. In accordance with Visscher’s directions, Tasman sailed from Batavia on 14 August 1642 and arrived at Mauritius on 5 September 1642. The reason for this was the crew could be fed well on the island; there was plenty of fresh water and timber to repair the ships. Tasman got the assistance of the governor Adriaan van der Stel. Because of the prevailing winds Mauritius was chosen as a turning point. After a four-week stay on the island both ships left on 8 October using the Roaring Forties to sail West as fast as possible. (No one had gone as far as Pieter Nuyts in 1626/27.) On 7 November snow and hail influenced the ship’s council to alter course to a more north-eastern direction, expecting to arrive one day at the Solomon Islands. 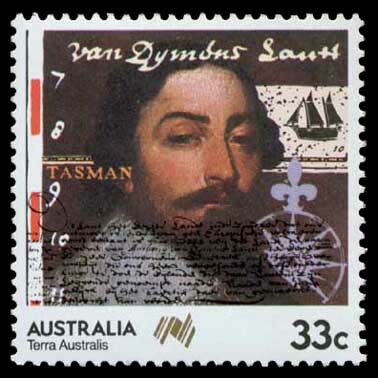 On 24 November 1642 Abel Tasman sighted the west coast of Tasmania, north of Macquarie Harbour. He named his discovery Van Diemen’s Land after Antonio van Diemen, Governor-General of the Dutch East Indies. Proceeding south he skirted the southern end of Tasmania and turned north-east, Tasman then tried to work his two ships into Adventure Bay on the east coast of South Bruny Island where he was blown out to sea by a storm, this area he named Storm Bay. Two days later Tasman anchored to the North of Cape Frederick Hendrick just North of the Forestier Peninsula. Tasman then landed in Blackman Bay – in the larger Marion Bay. The next day, an attempt was made to land in North Bay; however, because the sea was too rough the carpenter swam through the surf and planted the Dutch flag in North Bay. Tasman then claimed formal possession of the land on 3 December 1642. After some exploration, Tasman had intended to proceed in a northerly direction but as the wind was unfavourable he steered east. Tasman endured a very rough journey from Tasmania to New Zealand. In one of his diary entries Tasman credits his compass, claiming it was the only thing that kept him alive. On 13 December they sighted land on the north-west coast of the South Island, New Zealand, becoming the first Europeans to do so. Tasman named it Staten Landt on the assumption that it was connected to an island (Staten Island, Argentina) at the south of the tip of South America. He sailed north, then east and 5 days later anchored about 7 km from the coast. He sent ship’s boats to gather water, but one of his boats was attacked by Māori in a double hulled waka (canoes) and four of his men were attacked and killed by mere. As Tasman sailed out of the bay he was again attacked, this time by 11 waka . The waka approached the Zeehaen which fired and hit one Maori who fell down. Canister shot hit the side of a waka. Archeological research has shown the Dutch had tried to land at a major agricultural area, which the Māori may have been trying to protect. Tasman named the bay Murderers’ Bay (now known as Golden Bay) and sailed north, but mistook Cook Strait for a bight (naming it Zeehaen’s Bight). Two names he gave to New Zealand landmarks still endure, Cape Maria van Diemen and Three Kings Islands, but Kaap Pieter Boreels was renamed by Cook 125 years later to Cape Egmont. On route back to Batavia, Tasman came across the Tongan archipelago on 20 January 1643. While passing the Fiji Islands Tasman’s ships came close to being wrecked on the dangerous reefs of the north-eastern part of the Fiji group. He charted the eastern tip of Vanua Levu and Cikobia before making his way back into the open sea. He eventually turned north-west to New Guinea, and arrived at Batavia on 15 June 1643. With three ships on his second voyage (Limmen, Zeemeeuw and the tender Braek) in 1644, he followed the south coast of New Guinea eastwards. He missed the Torres Strait between New Guinea and Australia, and continued his voyage westwards along the north Australian coast. He mapped the north coast of Australia making observations on the land, called New Holland, and its people. From the point of view of the Dutch East India Company, Tasman’s explorations were a disappointment: he had neither found a promising area for trade nor a useful new shipping route. Although received modestly, the company was upset to a degree that Tasman didn’t fully explore the lands he found, and decided that a more “persistent explorer” should be chosen for any future expeditions. For over a century, until the era of James Cook, Tasmania and New Zealand were not visited by Europeans – mainland Australia was visited, but usually only by accident. On 2 November 1644 Abel Tasman was appointed a member of the Council of Justice at Batavia. He went to Sumatra in 1646, and in August 1647 to Siam (now Thailand) with letters from the company to the King. In May 1648 he was in charge of an expedition sent to Manila to try to intercept and loot the Spanish silver ships coming from America, but he had no success and returned to Batavia in January 1649. In November 1649 he was charged and found guilty of having in the previous year hanged one of his men without trial, was suspended from his office of commander, fined, and made to pay compensation to the relatives of the sailor. On 5 January 1651 he was formally reinstated in his rank and spent his remaining years at Batavia. He was in good circumstances, being one of the larger landowners in the town. He died at Batavia on 10 October 1659 and was survived by his second wife and a daughter by his first wife. His property was divided between his wife and his daughter by his first marriage. In his testimony (dating from 1657) he left only 25 guilders to the poor of his village. J.E. Heeres, “Abel Janszoon Tasman, His Life and Labours”, Abel Tasman’s Journal, Los Angeles, 1965, pp.137, 141–2; cited in Andrew Sharp, The Voyages of Abel Janszoon Tasman, Oxford, Clarendon Press, 1968, p.24. “European discovery of New Zealand”. Encyclopedia of New Zealand. 4 March 2009. Archived from the original on 10 November 2010. Retrieved 9 December 2010. “First contact violence linked to food”. New Zealand Herald. 23 September 2010. Retrieved 23 September 2010. “Abel Tasman’s great voyage”. Abel Tasman’s great voyage. Tai Awatea-Knowledge Net. Retrieved 14 September 2011. “The Tasman Map”. State Library of New South Wales. Retrieved 28 November 2012.